For a grandiose and regal ceremonial set-up, the Lana Mandap offers spirituality and luxury with awe-inspiring ease. Supported by symmetrical carved pillars, this mandap recalls traditional Indian architecture of centuries past, inspired by temple architecture and paying homage to Ganesha, with many depictions of the deity adorning ornamental decoration around the mandap’s central ring. 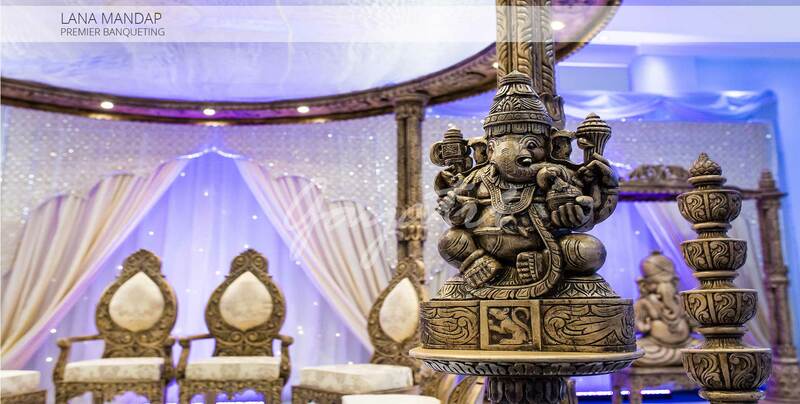 With the addition of Ganesha’s presence, this truly is a premier mandap for weddings and banqueting alike, bringing a stunning and regal touch to any ceremony. The central canopy is accompanied by twin archways, also carefully crafted and accompanied by early depictions of Ganesha, bringing spirituality and splendour to matrimony in any location. While other mandaps offer stunning architecture and are carefully hand-crafted, the Lana Mandap stands alone in that it offers premier hosting opportunities in both its luxurious stature and links with tradition and spirituality. It is also one of our more striking pieces, making it a popular choice for many.